A while back, I encountered the term “pee math” online. Kooky as it sounds, I instantly understood what it means. Those of us with certain types of disabilities are all too familiar with the need to ration our bathroom output. For some it means controlling the intake of liquids. For others, it’s more a matter of calculating how much you’ve had to drink, how long it’s been since you last emptied your bladder, and how long it will be till you can find the necessary assistance and/or accessible facility to do so again. It was suggested that I devise some other signal, a code word that my teacher would understand but no one else would. I was just six years old, and the best I could come up with was “Judy one two three.” (It was the swinging 60’s, and my teachers were on a first-name basis. Judy was the teacher’s name.) It worked! Over the years, there would still be some accidents as I resisted the inconvenience of interrupting my day to urinate. It was just such a hassle, asking someone for help and getting undressed enough to position a urinal. Perhaps if I’d been able to do it as easily and quickly as others, it would have seemed less annoying. But all in all, my needs were fairly well under control until about 10 years ago, in my mid-40s. I had colostomy surgery and, thanks to complications, an indwelling catheter for about three months. Afterward, between the cath and the surgery, I ended up with some nerve damage. It became harder to tell when I had to go. Around that time, I also tried to stay healthier. I began drinking a lot of water. You know where this is going. For a time, my urinary habits seemed uncontrollable. I went to a number of urologists, underwent tests. I tried Flomax to make it easier to empty my bladder fully. Then pills for overactive bladder syndrome. That’s when a urological surgeon recommended a suprapubic catheter. For those who don’t know, it’s an external cath that connects to a hole in the lower abdomen. It has to be changed periodically by a nurse. But, the doctor assured me, it would solve all my troubles. I wasn’t convinced. For one thing, I already had a surgical opening in my lower abdomen for my colostomy pouch. For another, I didn’t like the maintenance. The incision had to be kept clean and infection-free. And suprapubic catheters can and do come loose sometimes. I wasn’t convinced this would simplify my life. In fact, quite the opposite. Surgeons, I’ve found, favor surgical solutions. I sought another opinion. Somehow, online, I found a nearby urologist who claimed to have worked with quadriplegics. I immediately made an appointment. He upped my dosage of Flomax to 8 mg daily to ensure that when I peed I got out as much as possible so there wouldn’t be a buildup of what he called “residuals.” At the same time, he changed my overactive bladder medication to a strong dose (50 mg) of Myrbetriq, which was then a new drug. This removed (or at least eased) the sudden, reflexive “vacating” of my bladder without warning. The result borders on the miraculous. Someday, I may still need to go the catheter route, whether internal or external. But in the meantime, this balance of meds—at once calming and facilitating the outflow—remains effective. To be completely honest, it’s not quite that simple. I need someone to press hard on my bladder while holding a urinal in place. That’s partly because of that nerve damage from 10 years ago, partly from weak abdominal muscles due to the progression of my disability. But if I can get that, most days go pretty well. Provided, that is, that I keep track of how much I drink and when I last went. 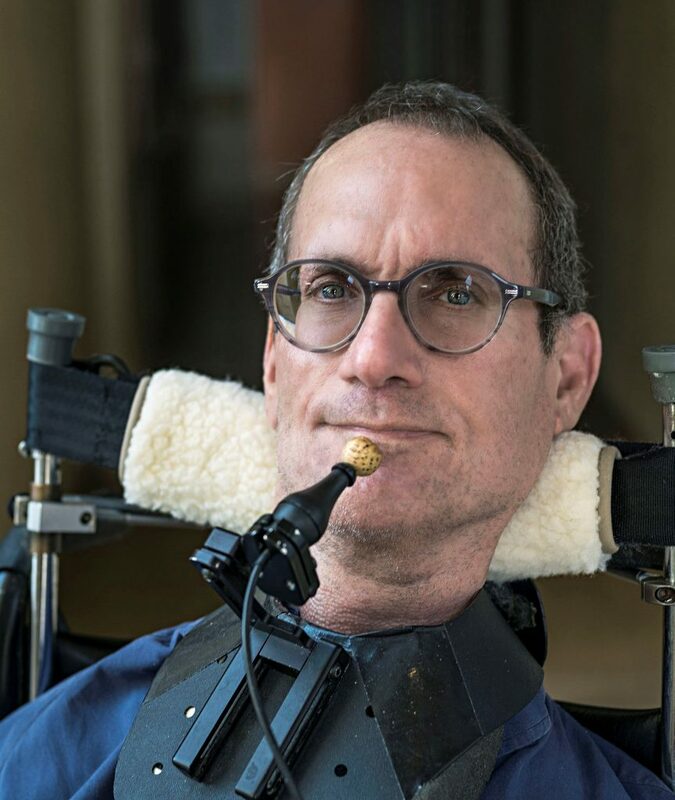 Our special contributor Ben Mattlin, was born with spinal muscular atrophy, a congenital muscle weakness that causes paralysis and related health issues. A highly regarded writer, Ben’s work has appeared in “The New York Times,” “The Washington Post” and “USA Today.” He lives in Los Angeles with his wife and children. Omg you are great at relaying tho great information. Having a daughter that I felt could not be left behind in school or life. I was the worse mother in the world… I should of let my daughter even at the old age of three tell me what she wanted in life…!! I never thought I’d find a treatise on pee interesting, but I did with this. However, I’d just as soon not be informed of the poop situation (heh-heh). Great share and example of the balancing act of finding personal solutions the that fit best for each individual.